I've been really busy with doctors, optician and hospital appointments this week. Hasn't left a lot of time for crafting. I do have my new glasses though to try to help with my double vision problems. I am off to Bath RUH next week to get my new hearing aids too I do hope they will help. I have finished the piggy money box my daughter wanted for her birthday. She is 16 but loves farm animals she is hoping to be a dairy farmer and will be starting the level 2 diploma in agriculture at college in Sept. 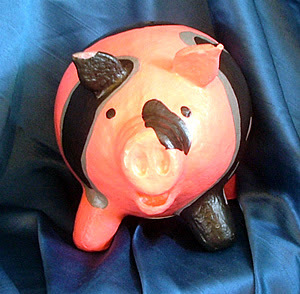 Here are a few pics of the finished papier mache money box. It doesn't have a name yet as I have left that up to her. 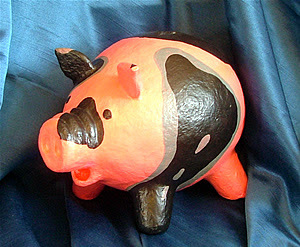 Sorry about the photo's they aren't very good, the pig is bright pink, black and grey. It does have a slot in the top and underneath is a plastic stopper, to get the money out. This was great to make and I think I will be making some more to sell, I am going to experiment with other animals too. Pop over to see what everyone else has been up to for handmade Monday at Wendy's blog 1st Unique Gifts. Your pig is great - so much character in him, and different too. Far too good to actually use! Happy Birthday to your daughter. well done on your painting! thats a very cute piggy :) and pretty original! the patches are very convincing! Well done on your piggy, he is so sweet and sure your DD will love him. Wow, the pig is fab! I can see these in all sorts of colours and patterns!